Another long day planned this week, and I was happy to have my good friend Dan join me. It's been awhile since we were able to meet up due to work schedules, injury, and other pursuits. But it was great to have the company, particularly in someone who would enjoy this beautiful place. We'd been emailing about some possibilities. Earlier in the summer, I tried to jot down some destinations and group things together into logical days, with some designated for below treeline days (in the event of worse weather), and above treeline days (clear forecasts or storms later in the day). I suggested a few of these better weather options, and we decided on East Inlet. This was really a perfect looking setup in my mind- follow a trail up to visit lakes, gain elevation and visit the peaks above the lakes, loose elevation and head back. Well, I guess it wasn't that simple. What were the words Dan used? "Intimidatingly ambitious"? We met in Lyons as usual and started the long drive up. The forecast was looking good but not great. Partial sun with some possible showers in the afternoon. It was raining as we entered RMNP, but we hit patches of dryness and finally drove into clouds near the top of Trail Ridge Road. On the other side, a calmer sense of weather prevailed. We started in darkness with headlamps on. This trail flows pretty well, and we made good time moving up though some intermittent drizzle. We had some debate about which way to go- which is to say do Mt. Wescott first, then deal with the bushwhacking of Paradise Park and Ten Lake Park, then peaks, then lakes, or the reverse. The weather made the decision, and we opted to see if the day would dry the bush out, as we would have gotten soaked going through wet stuff early in the morning. At Lone Pine Lake. Named, perhaps, for the tree on the small island? It is named on the 1961 map, but the earlier ones have no name, and the shape of the lake is quite different. We continued up through intermittent showers, never really enough to put on rain gear or even get wet, but it certainly wasn't the early morning sunshine we'd been expecting. Next up was Lake Verna. Very pretty, and made even more so by the tempest of clouds hanging around. We started to see some sun poking out to the east, and made our way around this lake, which is the longest in the basin. The official maintained NPS trail ends around here somewhere, but the unofficial trail is still in pretty good shape. My guess is that this area gets enough visitation to clean it up. Spirit Lake came next. You can see the still swirling clouds around us, enveloping the peaks to our east. The creatively named Fourth Lake (if you're counting, it's the fourth lake up in the basin) was next, still on a pretty obvious and well maintained trail. The precise "right" way to go disappeared as we moved up to around tree line. We were able to follow some matted grass and the occasional cairn here and there to continue up to Fifth Lake, which, as you may have guessed, is the fifth lake in the basin. We moved onto some stable talus and worked our way up to this lake. We finally hit the high point and started to drop down. Dan was in the lead, and before we could even see the lake, I said something like, "This is it!". He turned back and smiled, an ear to ear grin. Yes, this was it. We hadn't even seen the lake yet, but could tell from what we could see that this was going to be something special. We sat at the lake for a snack. All was right with the world. We watched with joy as the clouds swirled around Isolation Peak and The Cleaver and the sun tried to shine through to our south. Immensely peaceful and satisfying, if I had been struck dead at this second, in this place, it would have been with a smile on my face. We talked about the peaks above. Isolation Peak was actually my first thirteener, my first real mountain at all I suppose. I guess it does say something about me that I chose that over the easier and more popular peaks elsewhere in the park. I was in love with Wild Basin at first sight. It had to be Isolation. Looking backward to October 2011. I remember looking down at Fifth Lake, my feet dangling over lots of air. Someday I would see you, and that day had finally come. Feeling satisfied emotionally, mentally, and physically, we started up the grass and talus slopes to the massif above. Along the way we would pass by a pretty large flock of Bighorn Sheep. I counted a total of seven that we could see completely, plus a few heads poking up from points above. In the meantime, the clouds had cleared up, and the sun finally came out for good. Pointing to some of the other places we've been. It was fun to see some of the peaks that I'd visited just a week ago from a different vantage point. Andrews Peak and Ptarmigans Beak from the south. We got to the summit of Fleur de Lis in short order, and found a nice wind break to have a snack and sign the registers. Yes, registers. There were two jars here. Aiguille de Fleur is the rather blunt point that lies on a finger of land north of Fleur de Lis. Supposedly the easiest ascent route is 5.0, and a long 5.0 at that. I had seen pictures from the side, and found myself wondering if the steep grassy ramp here pictured to the left of the high point might be an option to obtain the summit. We could also see parts of Ten Lake Park to our south. This area looked so beautiful, even better than the photos I have seen. More Aiguille de Fleur. I left without any real feeling regarding the possibility of access of that ramp. It looks pretty darn steep. The other side of Isolation Peak. We continued toward Mount Craig, and found ourselves looking at point 11902. Over or around? There was a clear way around the south side, but it would involve some elevation loss. The north side looked worse. Why not enjoy some scrambling? We went up this point, finding some third class terrain, but eventually we reached a point where things got too hard. We backtracked a little and decided to drop down on the south side to avoid the more difficult climbing. The trees added a little bit of bushwhacking to this, but it wasn't too bad. We made the summit of Mount Craig without much more difficulty and basked in the sunlight and the great views, here again of Andrews Peak, Ptarmigans Beak, and Mount Alice. It's been pretty neat to see the other side of many of these peaks that are most frequently seen from the east. Back to Fleur de Lis and Isolation Peak. We added our names to the register, another list of Colorado greats. Paradise Park and peaks to the south. These are all on the border of RMNP/Indian Peaks, and would be attended to in short order. Picking out Aiguille de Fleur. We were totally feeling the high here, that feeling that (for me) only comes from hard exercise, adrenaline, altitude, and good company. I felt totally at peace with the world, completely happy and satisfied in a way that rarely comes. Which isn't to say I am generally unhappy and unsatisfied, but out here, the dials get turned up past 10, and a rarely felt sense of total well being floods over the psyche. Viewing Ten Lake Park, our next destination. Looking at possible descent routes. We ended up heading south east to hit one of the lakes, and then working out way west and south. We were able to stay on a game trail at first, but this soon became impossible. We kept trying to head more west only to find our possible route blocked by cliffs, despite what the topo looks like. The bushwhacking wasn't too bad in reality, with the main difficulty coming from dead fall, everything from massive old growth trees (I think I saw the single largest tree in RMNP that I have ever seen) to smaller and younger trees that were several feet off the ground and necessitated crawling under. We finally bottomed out in Paradise Park and found a fairly distinct but thin trail paralleling the creek. We stayed on this for a short time until we could see the route we'd picked up Mount Wescott from above, and cut over to that. In retrospect, we probably left the small comfort of this trail slightly too early, but things worked out ok. The bushwhacking was slightly more intense here, but we hit a gully that would take us up soon enough. At the top of this, we headed directly north. This peak is reported to be third class, and the south ridge looked a little more difficult, so we traversed around to the west, shortly finding a undergrowth covered ramp to take up. Upon reaching a plateau and a cairn, we headed back east to the ridge, and worked our way up from there. The summit was small and treed in, but still offered some good views of the surrounding area. Looking north from the true summit. The register was interesting, containing the names of the few who'd made the arduous trek to it, many of which were to be expected. I saw Jim Disney, a local who has climbed all the peaks in RMNP. And one we didn't expect- Troy Tulowitski. I am no baseball fan, but recognized the name from the news. Pretty interesting! This summit had seen no one since 2013. We headed back the way we'd come up, back down the gully to the creek, and to the thin trail. We did see a few signs that someone might occasionally clean the trail up a bit (logs sawn off), but it had obviously been awhile. In some places there was so much dead fall the trail became very difficult to find. Since we'd briefly explored it in the morning, we came to a place where Dan said, "Hey, I put my hand on that this morning." Though we still couldn't see it, seconds later we were back on the East Inlet trail. We stopped for a snack and to change out wet socks for dry. It seemed like forever, but it took us about four hours to go from Ten Lake Park to Mount Wescott to where we stood now. Chances were good we'd beat the sun back to the car. We looked for East Inlet Falls, but couldn't identify where it was precisely, and I think we'd both had enough bushwhacking for the day at this point. I'll have to find it on my return trip to Aiguille de Fleur next year. East Meadow and clouds. You can see Mount Wescott and Mount Craig here. A short detour to visit Adams Falls, which is pretty and very accessible. We made it back to the car right at 6:30 pm, giving us a 13 hour and 40 minute day. There were highs and lows of course, but I will tell you my friend: I enjoyed every second of it, and thank you for your company. This basin is pretty great, and the lakes here are real treasures, only getting better and better as elevation is gained and distance is added on. Mount Wescott is probably the least choice of the peaks due to the nature of the bushwhacking required to get there, but nothing comes without reward. If you are up for it and want to be surrounded by stunning beauty, make the trip to Ten Lake Park and spend a day exploring over there. It is truly a special place amongst all the special places in RMNP. 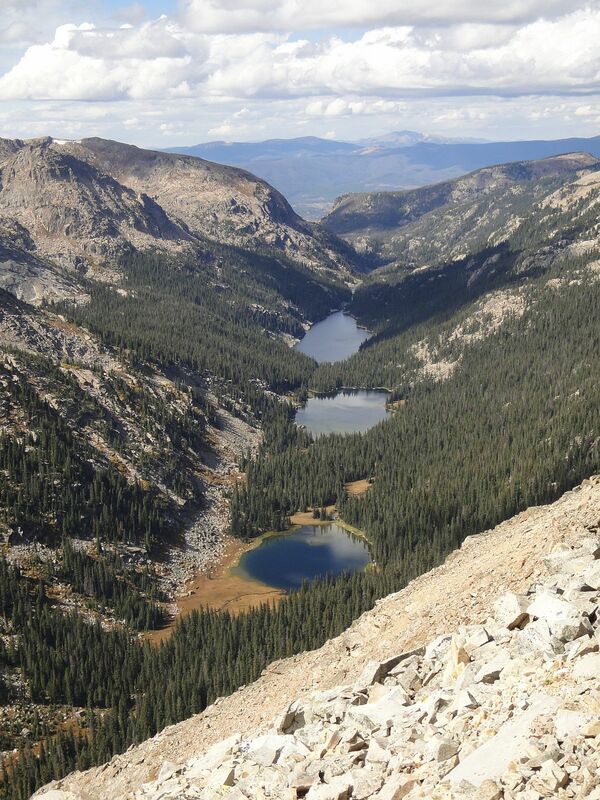 Lone Pine Lake, 9900 feet: 5.3 miles, 1500 foot gain. Moderate. Lake Verna, 10180 feet: 6.9 miles, 1780 foot gain. Moderate+. Spirit Lake, 10300 feet: 7.8 miles, 1900 foot gain. Moderate+. Fourth Lake, 10380 feet: 8.4 miles, 1980 foot gain. Moderate+. Fifth Lake, 10860 feet: 9.3 miles, 2460 foot gain. Strenuous-. Fleur de Lis, 12250 feet: 11 miles, 3850 foot gain. Strenuous. Mount Craig, 12007 feet: 12.8 miles, 3607 foot gain. Avoidable third class+. Strenuous. Ten Lake Park, 11200* feet: 13.5 miles, 2800 foot gain. Strenuous. Paradise Park, 10500* feet: 14.7 miles, 2100 foot gain. Strenuous. Mount Wescott, 10421 feet: 15.6 miles, 2021 foot gain. Third class. Strenuous-. East Meadow, 8540 feet: 19.6 miles, 140 foot gain. Easy. Adams Falls, 8460 feet: 20.7 miles, 60 foot gain. Easy-. As a whole, this hike covered approximately 21.1 miles with 7775 feet of elevation gain in up to third class terrain and with extensive bushwhacking involved. Strenuous+. *= exact elevation will vary since these areas cover vast swaths of land, and you can enter them at various places. Another week and another long day planned. After taking the last week to rest a stress injury, I was ready to get going, and get going I would- my first planned destination of the day lie 11.1 miles from the trailhead. Another, a unranked 12er, had seen only one prior ascent according to LOJ. Looking back now, if I hadn't actually come to a stop to sit and eat a snack and had two people catch up to me, I wouldn't have seen a single person all day long. This day was truly about the remoteness and isolation one can feel in a place that millions of people visit in any given year. I started from the trailhead shortly before 5, again making an hour or so by headlamp. I'd written about a wrong turn I took last time around. This time I put a point on my GPS where I met Ptarmigan Creek. I'd felt it was in the wrong place on the topo. And if my GPS is correct, it is indeed not correctly marked on the map, lying nearly .2 a mile farther along the trail than indicated. Something to keep in mind. I felt good in the cool morning air, and made great time, arriving at Lake Nokoni in about three and a half hours. Lake Nokoni as the sun started to warm things up. From here, I continued on the trail to Lake Nanita. This lake lies at exactly the same elevation as Lake Nokoni, but the saddle between them goes up over 11100 feet in elevation, so you'll have about 300 feet more elevation gain to get here, and of course this will have to be covered on the way back- if you head back the same way. The saddle is quite pretty though, offering some great views of the surrounding area. This is what Ptarmigan Towers look like from below. And what the towers look like from Lake Nanita itself. The trail deposits you right at the lake, on a perfect little boulder. I sat and listened to the water lapping at the land. It was quite peaceful. I was tempted to jump in, as I could see deep water right in front of me, but it was again too early in the day and the air was too cold. From here, I was able to head around the north side of the lake. There are some wet and marshy areas around the outlet, but the rest is dry. Fortunately, there is also a thin but mostly easy to follow trail. Fosters book suggests it is best to make your way up to point 11603 rather than stay down and follow the small stream up to the saddle. I did so, and was glad for that advice. This area is choked with rock. For reference, these boulders are up to house size. It was definitely easier to stay up hill and avoid talus hopping for the time being. Though I guess when the rock gets this large, it is more weaving your way through rather than over. Soon enough I was at the saddle to the east of Lake Nanita, which already looked as far away as a dream upon waking. The terrain was pretty nice- easy tundra (you can see it has turned brown, a sure sign winter is on the way), with some rock that was avoidable but not too bad if you wanted to or had to use it. From here I was able to look up and spy the route I planned to take from Lake Catherine to Ptarmigans Beak. I planned to ascend up, and take the dirt and scree gully right of center here. It looked a little steeper than I'd hoped, and alot looser than I'd hoped. But it looked like it would go, and if not, I was sure I could find a way. I now had to loose approximately one thousand feet to arrive at the lake. As I went along, I thought about all the hard to access lakes in the park. My first thought was for Lake Powell, which lies on the west side of the park, but whose easiest access comes from a big day starting in Wild Basin. The Fay Lakes in the Mummy Range certainly require some effort. The grouping of Gorge Lakes stand out in my mind, though the easiest access for many of those may actually be from the west side, starting at Milner Pass. Even the lake I visited last week, Pettingell Lake, was rather difficult to get to. But this one might take the cake. It is 12.8 miles one way from the North Inlet trailhead, and a touch over 4000 feet of elevation gain to get there, and around 2000 feet of gain to get back. So you have to do nearly a full marathon in distance, plus 6000+ feet of gain just to visit this lake. I probably don't need to say it doesn't get much visitation. Though the peaks above it do see some people on occasion, it appears as though you may only be able to see it from Ptarmigans Beak and perhaps from a point between Taylor Peak and Powell Peak. I couldn't even see it until I was more than halfway down to it. I mention that because this is another named destination within RMNP that I have not been able to find a single photo of online. Lake Catherine at the bottom of more large rock. I stayed in the gully this time, but eventually had to exit to the forest to the west. This looked too steep to go down from above, but the travel was easier than moving on these huge boulders, again many of them house sized. Lake Catherine, Rocky Mountain National Park. I kind of wish that lakes had registers too. It would be neat to see how many people have been here. I would guess if this lake sees more than a single person or two a year, that would be a big traffic year for it. This year RMNP celebrated their 100th anniversary, and I would think that this lake has very likely seen less than 100 people in those years. It was all sort of powerful and overwhelming to think about as I sat and ate a snack. This is real, raw, rugged and untamed nature and beauty. Ptarmigans Beak over Lake Catherine. I left the lake feeling great. I was very happy and honored to drink from this lake that very few people have ever seen, let alone visited. It was about 1500 feet of gain to get to the ranked and unofficially named Ptarmigans Beak. I made my way up an animal trail that stayed to the north and west of all the rock. The going was steep, but not too crazy. A last glimpse down at the lake. In short order, I'd gained 500 feet or so from the lake, and stood in front of a decision. It looked like I couldn't stay down in the gully to go up to the scree/dirt ramp I'd spied earlier, so I thought I would head north and then west to go around this. From higher up, I could see that you can follow this gully and escape on some grassy ramps before you hit the rock that looks technical... if you wanted to. The Cleaver and Isolation Peak from the other side. But it also looked like I could stay more toward Ptarmigans Beak and make an ascent up some nice grassy ramps. This looked like it would go from below, and would cut some time and distance off, ultimately having me exit with less gain to go to get to the peak. I decided to go that way. As I climbed up, the route made me think of a few different things. There was a steeper third class section that was reminiscent of the short rock gully on Oldman Mountain. The ramps themselves reminded me of The Arrowhead. I'd say this route was second class with a few sections of third that came with some exposure. Nothing too crazy. Yet. I was also rewarded, as the plants growing on this hillside produced the most lovely aroma, somewhat reminiscent of lavender, as I walked over them. In the end, this route worked out perfectly, and I had only a short stroll over to the summit. Ptarmigans Beak, Tanima, The Cleaver, Isolation Peak. Fleur de Lis and Mount Craig. My last vision of Lake Catherine and its beauty. For now. The summit register was another one of the all time greats, again a whos who of Colorado Mountaineering legends. I was honored to leave my name aside the likes of Kirk and Kirk, Dale, Foster, Knapp, Kalet, Garratt, Offerman, Nolan, Martin, and Gergen to name a few. The list of incredibly inspiring people I've never met goes on and on and grows longer and longer with every peak. I turned my attention toward Andrews Peak. There is a photo in Fosters book, as well as one here that shows a superfluously huge cairn built on the summit. I couldn't see it from Ptarmigans Beak, and thus thought this one might be a little tricky. Not in the sense of technicality, but in the sense of a false summit or two. I made my way down and then started up. This was the first time during the day that I really seemed to feel it, and I guess not without cause. It was relatively steep going, and at this point I already had 14 miles and nearly 6000 feet of gain under my belt. I was ahead of my time estimates, so I simply took my time and paused for a break when needed. I was able to get a great view of the grassy ramps route I took up, almost directly center, below the high point. It looked pretty wicked and steep from here. I passed by my original plan and looked down over the dirt and rock. It looked worse. I arrived at the summit to find this fairly short cairn. The tall one as pictured elsewhere must have been knocked over by weather or a person. The prevalent ethic in the outdoors these days is leave no trace, and one can hardly say a four foot high cairn isn't leaving a trace. But in that sense, any cairn is a trace. A summit register is a trace. So who knows. Something that big did seem rather silly to me though! I could look to the northwest and see the next goal of the day. I knew the terrain between here and there was rather flat, and felt I would be able to make pretty good time here. I was hoping it would take me no more than an hour to cover this distance. Lake Nanita, far, far away. Getting close to Ptarmigan Mountain, with Ptarmigan Towers on the right. 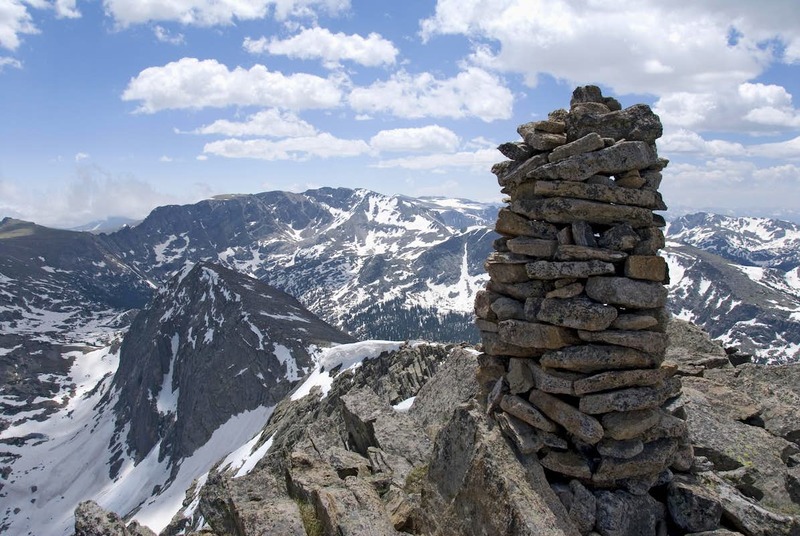 A closer look at the Ptarmigan Towers high point at 12220 feet. I made it to the flat summit of Ptarmigan Mountain. There was a small register here, a baby food jar placed by the Kirks earlier in the year. Unfortunately, it had already been well wetted. I opened it up and turned it toward the wind to dry it out a bit while I explored the possible route to Ptarmigan Towers. As I made my way toward this point, I noticed a small cairn built. I went to it and looked down. It didn't look good. I continued along to find the point where the ridge would connect with the land I was standing on. I made my way down a little bit. It looked like a drop of maybe ten feet at most to get down from where I was, but there were absolutely no holds and I wasn't about to drop off that distance from where I was. I went back to the small cairn. Maybe I needed to look a little more carefully. I looked down over the edge and noted a weakness in the rock. Just a thin crack, no more than a foot wide. But it looked like it had some holds. I went down it, making an awkward big step down move. This was surely 4th class, not the third I'd seen reported for this point. I stopped when things below me thinned out and the holds shrank. Ok. This would not do. I felt very exposed and unsafe. I'd only come down maybe ten or fifteen feet, and made my way back up. What to do? I could leave this point for the future, but I'd have to come all the way back here just for it. I still had plenty of daylight left, perhaps I could find another way. Even if it took me an hour to get there and back, that was less than coming all the way back here. There was a steep gully running down from this point. Maybe I could get into that to get up to it, but how could I get down there? I walked back toward the summit, looking at the ground below me. There was a gully that started just past the summit of Ptarmigan Mountain. It looked too steep, but I could see a small flat area east and below the summit. It would be easy to get to there, and then access the gully. Going down was very loose over dirt, rock, and scree. Coming back up was a bit better on grass with some rock and dirt. Twice I put my hands down in thistles. Yeow! I made it to the bottom of the gully, and worked my way up until things were flat. I decided to stay on the ridge line of the saddle, if that description makes sense. This wasn't the best idea and had me make a few exposed fourth class moves. Then I was finally at the base of the pinnacle. Looking back to Ptarmigan Mountain. See that snowfield to the left? This twisted looking piece of rock is the last small spire before you start the third class ascent to Ptarmigan Towers. The rest of the route was some slabby third class, followed by more stable third to the top. Just a few rocks marked the small summit. Looking back down the way I'd come up. Pretty darn steep! The Ptarmigan Towers high point as seen from the mainland. Longs, McHenrys, Chiefs Head in the background. The gully down from Ptarmigan Mountain definitely felt easier going back up. Perhaps my mind was just a little freaked out by that thin crack I'd tried to descend earlier. All in, it was some very steep and loose third class to get to this point in this method. While Listsofjohn isn't the be all and end all of peaks, this point only had one previous ascent listed there, by none other than Gerry Roach. In the end, it did take me nearly an hour and a half from the time I hit Ptarmigan Mountain to get to Ptarmigan Towers and back. Alot of time to go a very short distance, but this probably demonstrates the extreme difficulty of the terrain. I had finished my water on top of Ptarmigan Towers, and now hacked away at the snowfield pictured above. I ate some on the spot, and put some in my bladder to take with me. I didn't take alot though. I thought I'd be able to find some water fairly soon. From here, I headed almost directly south to my next goal of the day, Mount Cairns. This is barely a mountain, but rather one small closed contour loop on the topo overlooking the East Inlet drainage. I am sure the steep cliff faces that border it on the south side look impressive from below, but from my vantage point, it barely looked like anything at all. Of note, there is a small rock outcrop in the area. This is not the summit! No cairn or register here. It didn't look like anything at all, and I had to use my GPS to verify I was in the right place. I was. While I still had the snow with me, it was now almost two hours since I'd drank the last of my water. I spied a small pond, but the water looked disgusting. Nonetheless, I was feeling thirsty, and now realized I should have taken more time to cut some snow out and take it with me. I would just have to deal with it. I moved northwest from here, trying to contour around point 11588 without gaining or loosing any elevation. When I hit the ridge, I would descend to the saddle between this point and Mount Enentah, and then climb this peak. The bushwhacking was (fortunately) easy to moderate, with some dead fall and brush to negotiate. Twice I passed small seeps, but again the water looked tepid and foul. I ate the last of the snow shortly before I hit the summit of Mount Enentah. Another unspectacular treed in summit. But that's okay. An interesting thing is that the Alva B Adams water diversion tunnel passes directly under this peak. It is the only peak in the whole of the park to have this distinction. Without water, I found it difficult to eat anything, so I picked my most liquidy snacks and had a bite. From here I could either head northeast, hit the creek, and follow it down to the trail, or head southwest and descend the flatter western flank of this peak until I felt I could ascend the steep north face down to the trail. I decided to head southwest. I stayed on the ridge line until I got to around 9750 feet, and then turned north and descended directly to Summerland Park. It was quite steep, but again the bushwhacking wasn't too bad. Fortunately, I was only stopped once by a small cliff that I had to pick a way around. I could see from below that I was lucky, as I ended up coming down within spitting distance of a rock face that would've been too steep to descend. I made my way through the thick and tall grass of the meadow, and finally hit some good water. The tablets I use are one per two liters, and you have to wait half an hour. I decided to go with two tablets for two liters and wait twenty minutes. At this point it was about an hour and a half since I'd eaten the last of the snow, and over four hours since I finished off the water. I was a little thirsty! Moving through the grass felt like snowshoeing, and several times I found clearings that had been tamped down by elk or moose. Fortunately, I ran into neither, and after what felt like a long time, hit the trail. It was the second time this day that I felt I should bend and kiss the earth. It had been twenty minutes, and I drank greedily and ate some food. I decided to hike as quickly as I could, and again, just beat the sunset to the car. Only a two hour drive in darkness ahead of me now! Some elk were spotted as I drove back through the park. I made good time for the most part, but got stuck fifth in line behind someone coming down 36 between Estes and Lyons. Whether you drive this road frequently or not, please be aware. When you are slowing down to 25 mph for every curve and there is traffic stacked up behind you and some of those people start to illegally pass you, please use the slow vehicle pull outs! I got back home, ate some food, took a shower, and collapsed into bed. Rest! What a day this was, visiting pristine and unspoiled alpine lakes that rarely see a soul and peaks that see a few people a year, if that. Not much to my surprise, the west side of RMNP is proving to be just as beautiful and inspiring as the east side. At the same time, it definitely feels more vast and open. Of course, this means longer days, more mileage, more elevation gain. I am all too happy to rise to the challenge! Lake Nanita, 10780 feet: 11.1 miles, 2280 foot gain. Strenuous-. Lake Catherine, 10600 feet: 12.8 miles, 1800 foot gain. Strenuous+. Ptarmigans Beak, 12241 feet: 14.1 miles, 3841 foot gain. Third class (my method). Strenuous. Andrews Peak, 12565 feet: 15 miles, 4165 foot gain. Second class. Strenuous. Ptarmigan Mountain, 12324 feet: 16.7 miles, 3824 foot gain. Second class. Strenuous. Ptarmigan Towers, 12220 feet: 16.9 miles, 3720 foot gain. Third class+. Strenuous+. Mount Cairns, 10880 feet: 19 miles, 2480 foot gain. Second class. Strenuous-. Mount Enentah, 10781 feet: 20.7 miles, 2281 foot gain. Second class. Strenuous-. You'll also go by several destinations such as Cascade Falls and Lake Nokoni that I have covered here. As a whole, this hike covered approximately 23.6 miles with just over 8000 feet of elevation gain in up to third class terrain. Strenuous+.